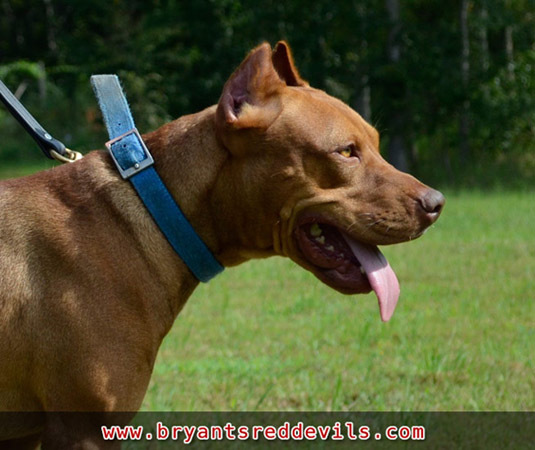 ﻿ Bryant's Red Devils Red Nose Pit Bull Breeders in Georgia. Old Family Red Nose Pitbull Puppies for Sale. 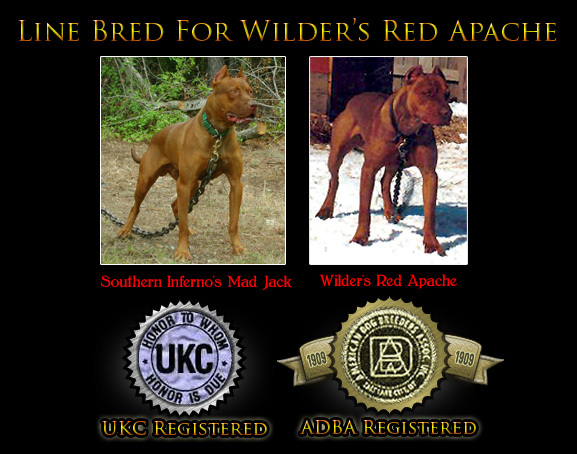 We have been breeding traditional, athletic, old school, red nose pit bulls for over 2 decades. 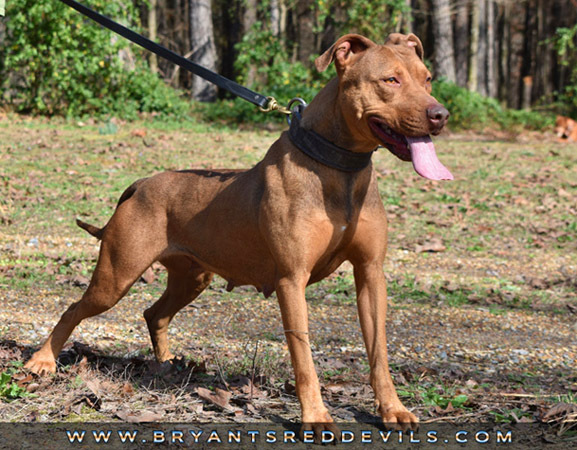 Our Red Nose Pit Bulls are Dual Registered with both the UKC and the ADBA, with Purple Ribbon, Champion, and Grand Champion Red Nose and Old Family Red Nose (OFRN) pit bull bloodlines in their backgrounds. 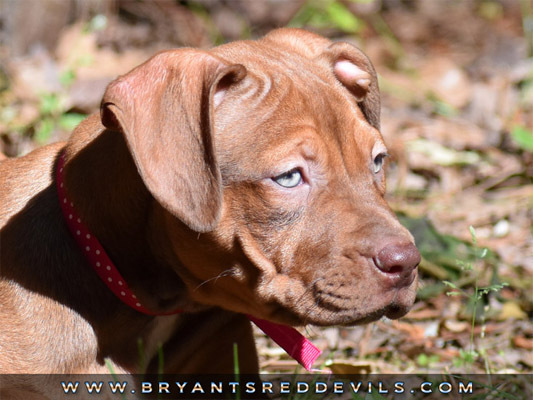 We have a few litters of red nose pit bull puppies for sale each year, and we offer pit bull stud services to approved females. 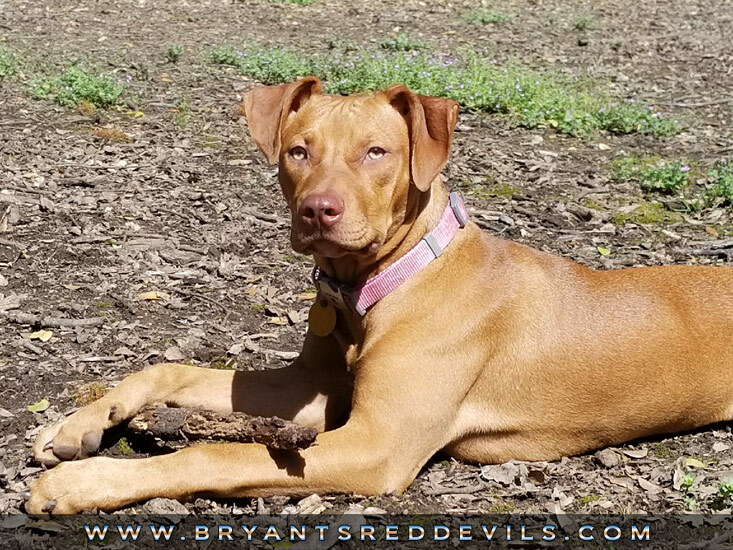 We are located in Adairsville, Georgia which is 1 hour south of Chattanooga, TN and about 1 hour North of Atlanta, GA.
Temperment is very important because all of our pit bulls must be trusted around our children, and we want others to be able to trust them with their children. We also used these dogs to hunt wild boar for many years. Temperment is important when hunting with dogs because they must have the ability to do their job while being easy to handle by any hunter. 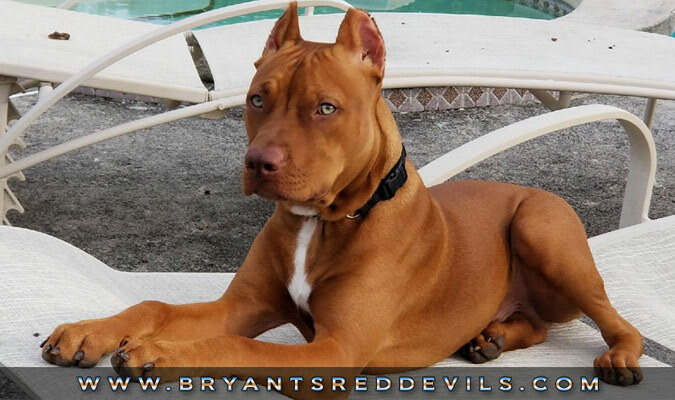 Our goal is to produce, quality, healthy, even-tempered American Pit Bull Terriers with the ability to do it all! We want to stress that we are NOT breeding for size or for color. We are striving to achieve the total package. Drive and structure interest us most because these are working dogs. 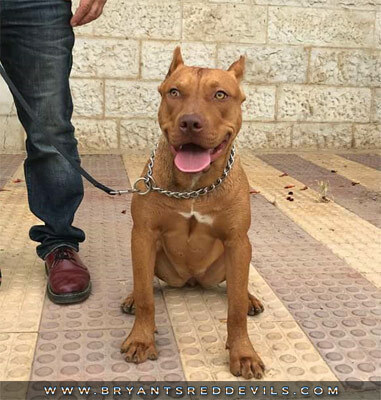 If you are looking to own a red nose pitbull that will provide your family with years of enjoyment AND get that "WOW, what a beautiful dog!" reaction, one of our dogs will definitely fulfill your needs. 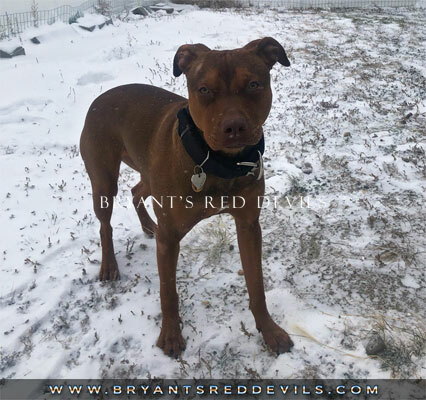 Not only are our red nose pitbulls beautiful, they also have wonderful temperments, awesome structure and conformation, true working ability, and drive... all in one package!!! While the most important job that any dog can do, is being a loving, and loyal companion. We have the satisfaction of knowing that our dogs are intelligent and digilent enough to perform nearly any task that is required of them. We used our red nose pit bulls as hog dogs to catch wild boar for many years, but they also make wonderful family pets. 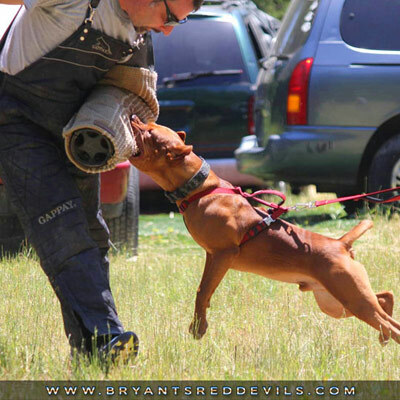 The red nose pitbulls that we have produced have been used for other kinds of work too, including personal protection work, weight pulling, Schutzhund training, and several of our red nose pit bulls have been featured on TV and in the APBT Gazette. We ARE in favor of working pit bulls in a sport (like hog hunting) where they can test and prove themselves legally. This keeps GAMENESS alive in the breed. Gameness is the desire to keep going when hurt, tired and even losing. This combined with the willingness to protect their loved ones, are the hallmarks of the pit bull breed, and that is what we are working to preserve. Our pit bulls are fearless warriors while hunting, and fearless guard dogs when it comes to protecting their family. Contrary to what some people say, pit bulls love children. Our kids have been raised up with pit bulls since birth. Our dogs would give their lives to protect our children (as if they were their own) and I feel my childrens lives have been enriched because they have these dogs in their life. I would protect my dog with my life just as they would do for me! It is an unconditional love. In my opinion, having a dog for a friend is much better than having a human for a friend. A dog will never judge you and they love you for who you are! No matter what. We have worked with many people over the years and we are always happy to hear when they are satisfied with the dog they bought from us. Have a look at what our clients say. Jen, I want to thank you. He is such a beautiful dog and his prey drive is so high, that's why I have him as a working dog. He's calm, cool, collective, people friendly dog, but he knows what to do when you he needs to. I'm going to win a lot of trophies with this dog, believe me, thank you. Couldn't be more happy with him. He's awesome! Just wanted to say Gracie is an amazing girl. I can't believe her agility and coordination she already has at this age. She is very easy to train, very bright and wants to please. Great Dog!!! Gracie is in training at Bullet Proof Pitbulls in Canada. Jeremy only trains what he thinks is worth training and he really likes her. He says she has the right DNA, good breeding and serious attitude when messed with by the pack of pups she is with. Now he has to harness and control it for the handler to turn it on and off. He says she is a sweet girl but has the right disposition and is really motivated to please. P.S. My wife has two Yorkshire's 8 and 10 lbs. Gracie seems to like and put up with. Thank you so much, she is everything I hoped for and more. You produce the most beautiful pups in the world. Georgia Peach, sits, shakes, lays, walks on a leash. Smart girl! She is doing great, super playful and super sweet. Getting along with all the other animals my friends have. I just wanted to thank you for everything. Our pup is safe and sound and we absolutely love him. I'm going to take him to the vet to get him his vaccines so that he can go on walks and burn off that energy. Thanks again! A pleasure doing business. She goes crazy with my daughter, so totally happy about that... Loves the couch, and sleeping with my daughter lol. She goes to the bathroom outside, we couldn't be more happy. She came to a home with tons of space and gets plenty of love. She's already spoiled... It makes me happy that you actually care. So happy we decided to purchase from you. She's freaking awesome... She's got so many complements my head is about to burst. Thank you for such a fine dog. Want to see our upcoming breedings ?